Building on the launch of its Local Updates product for businesses last week, Foursquare announced plans to roll out Promoted Updates on Wednesday, marking the company’s further push into offering a more comprehensive array of tools for its merchant partners. Similar to Local Updates, Promoted Updates allow businesses to push out recommendations to potential customers, serving as advertisements to Foursquare users as they move throughout the world. The updates appear based on factors like proximity, time of day and past places you’ve visited, Foursquare says, so that users will only be seeing the most relevant sorts of ads. So, for example, say you’re in SoMa around noon, and have a history of eating at sandwich joints. If a merchant like Caffe Centro (one of my lunch standbys) placed a promoted update message, you’d probably see it in your stream. Promoted Updates only appear when a Foursquare user opens the Explore tab, essentially an in-app recommendation engine that suggests places of interest nearby, again tailored to your Foursquare history. That’s somewhat in line with the Google analogy; A search query requires intent, putting in a request, and being served a series of relevant suggestions by Google. That’s how Foursquare sees Explore, a way to express the intention to discover places of interest without knowing exactly what it is you’re seeking. Just like Twitter and Facebook did with their respective “promoted” products, Foursquare aims to increase a merchant’s visibility through promoting it in the stream, that portion of the app which receives the most eyeballs. What’s more, updates also offer the ability to attach a message. Such a message could contain a deal or special promotion, a potential hook to getting more foot traffic in the door. 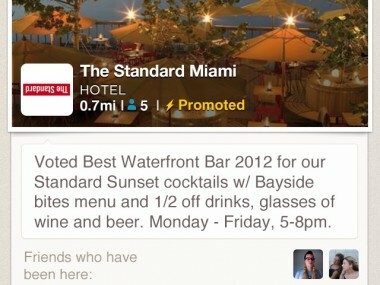 In a more grand sense, Promoted Updates are in line with Foursquare’s attempt to take seriously its monetization strategy. For some time, merchants have had access to this wealth of user check-in data — gender breakdown, visitation frequency and times of day, among other statistics — but until recently, they haven’t had the opportunity to put it to good use. Now, after more than three years of collecting data, Foursquare will actually sell tools like Promoted Updates to businesses that wish to capitalize on the popular, 20-million-user-strong platform. Typically those tools have been found from third-party vendor companies, cutting Foursquare out of a potentially lucrative revenue stream. For now, details are scant on just how lucrative it is for Foursquare. Chief Revenue Officer Steven Rosenblatt tells me each partner pays on a cost-per-action model, and each promotion lasts for several months, though he wouldn’t go into further detail. The tool is currently in a pilot mode, launching with only a handful of about 20 or so partners including the Gap, Walgreens and Best Buy. After a few months of testing and feedback, the company will likely roll it out to more of its participating network of more than one million existing merchants.